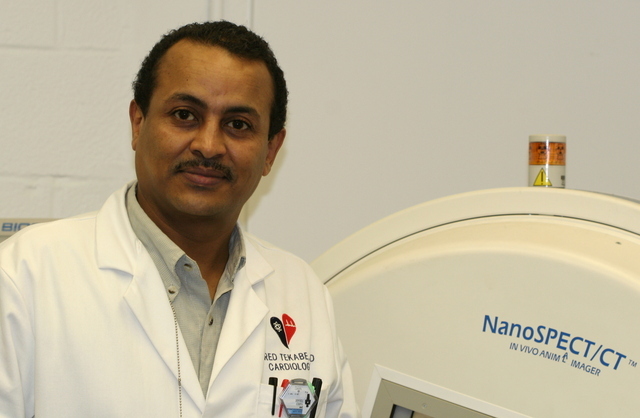 New York (TADIAS) – In Spring 2009, we featured Dr. Yared Tekabe’s groundbreaking work on non-invasive atherosclerosis detection and molecular imaging, which was published in the American Heart Association´s journal, Circulation. As in most chronic heart disease conditions, the plaque that accumulates in blood vessels is usually not detected until it leads to serious, and often fatal, blockages of blood supply such as during an episode of heart attack or stroke. Having received a $1.6 million grant from the National Institute of Health Tekabe’s research focused on the use of novel molecular imaging techniques to identify sites of inflammation that can help us with early detection of atherosclerosis. In 2010, his work was highlighted in Osborn & Jaffer’s review entitled “The Year in Molecular Imaging,” noting that Tekabe and colleagues had developed a tracer that imaged RAGE — a receptor for advanced glycation end products, which is implicated in a host of inflammation-related diseases including artherosclerosis, cancer, diabetes and alzheimer’s. Tekabe’s group, along with his colleague Dr. Ann Marie Schmidt, holds a patent for this RAGE-directed imaging technology. Tekabe’s lab also used similar imaging technology to detect RAGE in mouse models who had artifically-induced ischemia (restriction of blood supply) in their left anterior descending coronary artery, which is the main supplier of blood to the left ventricle. When blood supply is restored (reperfusion), the sudden change may also cause further inflammation and tissue damage from impact. By being able to trace RAGE and pathways of inflammation using molecular imaging techniques, Tekabe has demonstrated that the highest RAGE expressing cells were the injured heart muscle cells undergoing programmed cell death. Tekabe’s research in myocardial ischemic/reperfusion injury showed that RAGE could be traced in areas of inflammation in a non-invasive manner in live mouse subjects. The findings were presented at the 2011 World Molecular Imaging Congress scientific session, and was published in the Journal of the American College of Cardiology in January 2012. An editorial entitled ‘Visualizing the RAGE: Molecular Imaging After MI Provides Insight Into a Complex Receptor” accompanied Tekabe’s article, and emphasized that Tekabe’s research “continues to provide a solid foundation and proof of concept” that non-invasive imaging of RAGE following induced myocardial ischemia “is feasible” in live subjects. Tekabe’s findings also have important implications for future antibody therapy formulations that can be used to treat RAGE-related chronic conditions. Tekabe hopes to translate his studies on mouse models to larger mammals and eventually to humans. Molecular imaging studies such as the one Tekabe has undertaken are critical in prevention of chronic cardiac conditions and could potentially decrease the number of sudden deaths from heart attack as it may allow physicians to make early and life-saving diagnoses. For sure hard work paid off ! In fact, I read your article on “American College of Cardiology Foundation” published on Jan 9,2012. As always, I am one of your proud sister ! I am proud of Dr. Yared’s achievements and his hard work to make a difference in this world and contribute a big step to medicine. Gobez! Waiting for the film he will be acting in. He is good looking, witty and intelligent. He will also make a good actor. I am holding my breath for the day when…. Good stuff Dr Yered. Thank you. It is not unusual these days to see Ethiopian guys dropping dead because of heart attack and stroke at a very young age. is diet and lifestyle also a factor? I like the ending, so unexpected that it makes you laugh. At second thought, I may have the perfect script for you. Thank you Tseday. Very interesting!! Thank you so much for presenting this issue in a simplified way. Dear DR YARED i can’t tell you how happy i am. Science and art are so connected. Creativity exists in both and passion too.